Dr. Weller featured at KNU in Kazakhstan this month! 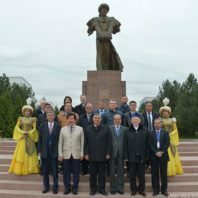 Dr. Charles Weller was one of several international plenary speakers for the 5th Annual “Farabi Forum” at Kazakh National University (KNU, Almaty, Kazakhstan, Apr 3-4). 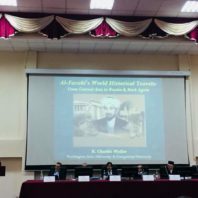 His talk on “Al-Farabi’s World Historical Travels: From Central Asia and the Middle East, to Europe and Russia, and Back Again” was featured among scholars and dignitaries from Turkey, Syria, Tajikstan, the Netherlands and Kazakhstan; it will be printed in the conference proceedings. Dr. Ray Sun has been chosen to receive a summer fellowship from the Center for Digital Scholarship and Curation! Dr. Sun has been developing a digital exhibit of the research he has been exploring over the last two semesters that connect the history of Washington State University to World War II. Congratulations Dr. Sun! We would like to applaud our undergraduate students who participated in the Showcase for Undergraduate Research and Creative Activities. We would further like to recognize two students who received awards that were mentored by our own Dr. Lydia Gerber. Krista Brutman received a Gray Award, abstract titled “Left-Over Women: Collectivist Feminism in Modern China.” The Gray Award is the second highest award presented at SURCA with at least one being offered in each of the eight categories of study. Krista is a mathematics major from the Pullman campus! Will Millick received a Novice Researcher Award, abstract titled “Considering Women in the Great Leap Forward.” The Novice Researcher Award is given to students who have been working on their projects for two semesters or less and were awarded excellent marks by the judges. Will is an architectural studies major from the Pullman campus! Congratulations to both students! Please click here if you are interested in reviewing the abstracts that were presented or to learning more about SURCA! 3 faculty members selected as LIFT Faculty Fellows! The department is happy to announce that three faculty members in the History Department and RCI Program ­– Karen Phoenix, Matthew Unangst, and Michelle Mann – have been selected as LIFT Faculty Fellows. The LIFT Program (L.earn I.nspire F.oster T.ransform) is aimed at supporting committed educators at WSU to promote transformative student learning. It is part of WSU’s Transformational Change Initiative. Fellows join a group of educators working to share and learn techniques of student engagement and learning through Spring and Fall 2018.